Palm Sunday fronds: Churches should buy palms from environmentally sustainable harvesting villages. Are Your Palm Sunday Palms Bad for the Environment? Too many churches are buying fronds from environmentally damaging harvesters. 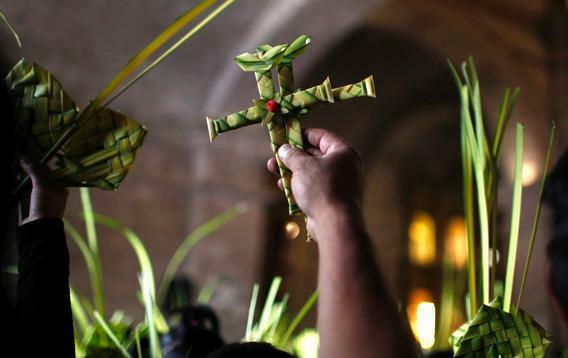 March 24 is Palm Sunday, which means that millions of Christians across the country will be celebrating Jesus’ entrance into Jerusalem by carrying palm leaves, often shaped in the form of a cross, into their places of worship. Where do these palms come from? Most likely they have been imported from one of a few Latin American countries: Guatemala, Belize, or southern Mexico, for instance. And most likely they have been harvested in a manner that is harmful to the environment. Harvesters are often paid by volume rather than quality, and they have a strong incentive to cut as many leaves as possible, without paying attention to what this reckless cutting is doing to the fragile forests of one of the world’s most important ecological regions. In a few select communities in northern Guatemala and the southern Mexican state of Chiapas, however, villagers—with help from governmental public lands agencies and organizations such as Rainforest Alliance and Pronatura Sur—have adopted a series of impressive harvesting practices aimed at protecting the environment and ensuring a long-term supply of sustainably-harvested palms. Because palm plants need the shade of the forest’s tall trees to survive, maintaining a sustainable palm crop also gives villagers an incentive to protect the forests as a whole. Churches in the United States should buy their palms from these villages. I can attest first-hand to the benefits that these new harvesting techniques are bringing to the forests of Guatemala and Mexico. Last month, I spent eight days learning from the villagers who practice sustainable harvesting of palms. In the remote Guatemalan villages of Carmelita and Uaxactun, farmers have divided their lands into regions and harvest in only one region at a time. When they finish with one, they leave it alone for up to nine months to regenerate. In the aqua-colored Bodega de Palma in a Mexican village called Sierra Morena, a woman explained how she and her team of sorters go through each leaf that comes in to make sure it is of sufficient quality for export. Harvesters are paid only for the quality leaves they bring in, and if they bring in too many flawed leaves, they can be fined. The number of wasted palm leaves has shrunk from about 60 percent to around 10 percent or less because of this system. In a small town in the Mexican Sierra Madres called Tierra y Libertad, I hiked into the forests with Arbey Gomez Garcia, the head of the community’s palm group, to learn how harvesters are trained to cut down only certain leaves from the palm plants and to leave others alone. Far into the forest, Arbey showed me a small, well-marked field of palms that acts as a control group for the plantation. By collecting data on the growth of every leaf on every plant in this area, the community can monitor the health of the forest and predict with some certainty the number of palms that can be harvested in the next season. Churches in the United States have an easy way to make sure that the palms they buy are provided by these responsible steward communities. Eight years ago, Dean Current, an expert in natural resources management at the University of Minnesota, started the “Eco-Palm” project. With help from the Commission for Environmental Cooperation, a research group created to study NAFTA’s effects on the environment, Current has reached out to religious organizations, such as Lutheran World Relief and the Episcopal Church, to convince parishioners to pay a little extra for sustainably harvested palms. Five cents per frond is returned to the communities, which use the extra funds both to support their sustainable harvesting practices and to pay for much-needed improvements to the life of the villages. In Uaxactun, for instance, the villagers explained to me how the money has been used to put a floor into a schoolhouse and hire new teachers for older children. The Eco-Palm project has grown substantially, from the 2005 pilot year when Current and a graduate student delivered palms to churches in North Dakota and Minnesota from the back of a van, to this past year, when churches purchased nearly 1 million leaves. Still, though, the number of sustainably harvested palms makes up a small percentage of all palm leaves purchased by churches in the United States for Palm Sunday. As a member of the palm harvesting group in Tierra y Libertad argued, “We work very hard because the international community wants us to preserve the rain forest, and we are doing so. We are happy to be protecting our forests, but I think we should have a better life for what we are doing for the environment.” He made a lot of sense. In recent years, organized religion has come a long way in recognizing the importance of going green. Consistent with this trend, churches should at the very least make sure that their own religious practices are not harming the environment.